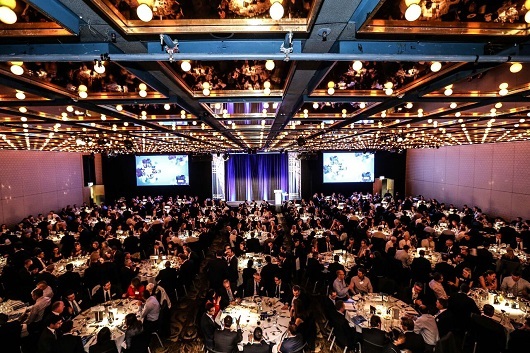 More than 600 leaders from across the national infrastructure sector gathered at 2016 Annual Infrastructure Oration and National Infrastructure Awards gala dinner, held in Sydney. This year’s Oration was delivered by Vince Graham – who recently retired after more than 47 years in senior public service roles; while the Barangaroo Delivery Authority and Lendlease were awarded the prestigious Project of Year award – for the transformational Barangaroo Reserve project. Mr David Webster, Deputy Secretary, Commercial, Victorian Department of Treasury and Finance. IPA thanks our Oration Sponsor, MUFG and our Category Sponsors: Calibre; Coffey; Hansen Yuncken; MinterEllison; NSW Department of Premier and Cabinet; NSW Ports; MUFG; and The Commonwealth Department of Infrastructure and Regional Development. 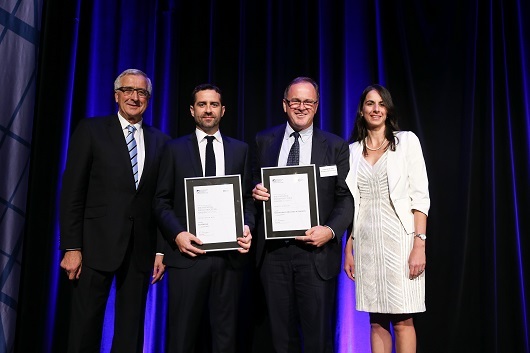 Last night’s awards saw IPA Chairman Adrian Kloeden present Ken Mathers, the former CEO of the Linking Melbourne Authority, with the Chairman’s Prize which recognises individual excellence and a deep career-long contribution to the sector. Across a more-than-50 year career, Ken has worked across every aspect of Victoria’s road sector – commencing as a project engineer – and advancing through to lead the planning and delivery of every major toll road in recent times. Ken Mathers has played an instrumental role in developing and refining road Public Private Partnership (PPP) procurement models, from the CityLink through to the East West Link – and also oversaw Peninsula Link – the first availability-based toll road. Despite the unfortunate circumstances which saw Ken’s last signature project – the East West Link Motorway – cancelled prior to construction – he was recognised for a career that has fundamentally changed the shape and pace of Melbourne’s broader transport network, and led the global development of PPP procurement models. 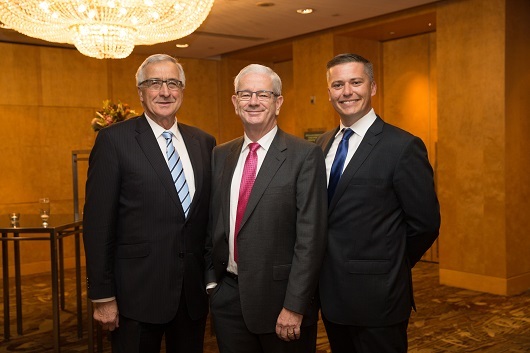 IPA congratulates Ken Mathers for his life-time contribution to the sector. Campbell Newman (when Lord Mayor of Brisbane). The Women’s Achievement in Infrastructure Award was presented to Kerrie Mather from Sydney Airport, recognising her lifetime of outstanding service, ongoing leadership, and achievement in the sector. From cutting her teeth in infrastructure finance during the reforms of the 1980s and 1990s, through to leading an ASX top 50 organisation, Ms Mather has been at the forefront of the Australian infrastructure sector for over 20 years. In her role as CEO of Sydney Airport, Ms Mather leads a multibillion dollar operation that contributes to the national economy, generates jobs and impacts upon Australia’s logistics, tourism, aviation and infrastructure sectors. Prior to this, Ms Mather was a central figure in infrastructure financing and advisory roles, largely on major toll and aviation projects. Ms Mather joins a distinguished list of past winners including Leilani Frew and Thao Oakey. 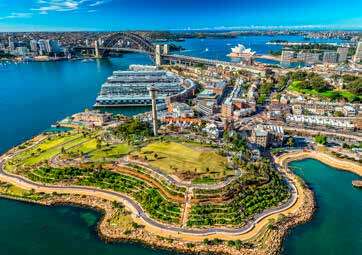 Australia’s Infrastructure Project of the Year was awarded to Barangaroo Reserve, a redeveloped parkland and new landmark for Sydney. In choosing the parkland, the Judging Panel made a strong statement that projects need to be more than just bricks and mortar, they need to offer social and cultural improvements. Barangaroo Reserve was successfully able to achieve this and in the process set itself apart from a strong field of candidates. The $250 million project cleverly integrates land use that improves community amenity with efficient and cost effective infrastructure. The reserve includes tidal rock pools created from sandstone excavated from Barangaroo and a massive new cultural centre, known as the Cutaway, built inside the headland. Former winners of the Project of the Year include Legacy Way, Regional Rail Link, the NSW budget reform process including the refinancing of the Sydney Desalination Plant, the New Royal Children’s Hospital, the Gateway Upgrade Project, Melbourne Channel Deepening Project and Defence Headquarters Joint Operations Command Project. The acquisition of Brisbane’s AirportLink M7 (ALM7) is an important transaction, demonstrating substantial appetite for Queensland toll roads and wider infrastructure investment. ALM7, a 6.7-kilometre motorway, forms a keystone connection between South East Queensland’s key economic precinct, surrounding the port and airport. The motorway opened in 2012 but was placed into receivership following lower than anticipated traffic flows. The sale process saw compressed timeframes and strong price competition between the bidders, with integration benefits and other aspects of the bid seeing a strong return for the vendor – forming an important contemporary reminder of the appetite that remains for Queensland infrastructure projects. The $1.15 billion Sydney Metro Northwest Tunnel and Station Civil Works (TSC) sees the construction of twin 15-kilometre tunnels from Bella Vista to Epping, the longest railway tunnels in Australia. The massive tunnelling project sees excavation and civil works for five new stations at Bella Vista, Norwest, Showground, Castle Hill and Cherrybrook, as well as two service facilities. Structured as a Design and Construct (D&C) package, the tunnels and stations were completed ahead of schedule and on budget, with four tunnel boring machines taking only 16 months to excavate and line the tunnels between Bella Vista and Epping. When completed in the first half of 2019, the Sydney Metro Northwest will see a train every four minutes in the peak – representing Australia’s first fully automated, turn up and go metro-style rail service. The lease of the TransGrid electricity business is the first transaction under the NSW Government’s restructure and divestment of the state-owned electricity transmission and distribution sectors. The TransGrid lease saw a remarkable price of circa $10.258 billion – representing a multiple of 1.6x the Regulated Asset Base – far higher than the most optimistic price forecasts and the largest completed Australian M&A transaction of 2015, and the third largest power deal globally. The successful bidders, the NSW Electricity Networks Consortium, comprises a mix of domestic and overseas investors, including: Hastings Funds Management, Spark Infrastructure, Tawreed Investments, Caisse de dépôt et placement du Québec, and Wren House Infrastructure Management. This followed a highly competitive process with a total of four shortlisted bidding consortia. The New Generation Rollingstock (NGR) project involves the delivery of 75 six-car trains for the South East Queensland passenger rail network and the construction of a state-of-the-art purpose-built Maintenance Centre at Wulkuraka, Ipswich. The maintenance centre includes all necessary specialist equipment to service and repair the new trains for the next 30 years. A range of Building Information Modelling (BIM) software packages and other supporting tools were deployed on the project to support the creation, dissemination and update of accurate project information. This was the first time BIM had been utilised on a project of this size and nature for the Queensland Department of Transport and Main Roads. The Judging Panel noted that the NGR project represents a significant investment in trains and will support the Government’s long-term commitment to public transport. By using BIM, the entire project build was able to be simulated through a range of different techniques, including: fly throughs, walk-throughs and activity sequencing. Whole safety procedures on the project were developed around the implementation of activities considered to contain significant risk components by using the building model to simulate the implementation of the processes concerned and effectively creating a digital method statement for specific processes. The use of BIM on the NGR Wulkuraka Maintenance Centre build contributed to the successful and early delivery of the project. The 2011 Brisbane floods caused major interruptions to the city’s transport network, with nine of Brisbane’s 20 passenger ferry terminals destroyed or severely damaged. In response, Brisbane City Council (BCC) and the Queensland Government held an open design competition for new terminals that would be flood resilient, attracting 65 submissions from around the world. Aurecon and Cox Rayner Architects were appointed for the design of seven terminals – at St Lucia, Regatta, North Quay, QUT, Maritime Museum, Holman Street and Sydney Street – adopting world-first technical innovations to address flood resilience, at the same time meeting BCC’s objectives for functionality, accessibility and iconic architectural status. This included introducing a novel single pier structure upstream of the pontoon as the single sliding lateral support, with the gangway acting as a radial arm for a second point of lateral support – a bold departure from conventional approaches to similar infrastructure. This prevents damage by enabling the pontoon to absorb the energy of and deflect away heavy objects, and by enabling the gangway to automatically detach from the shore and swing behind the pontoon, away from debris. The design also introduces what is believed to be a world-first solution for disabled access, with unique gangway floor mechanics maintaining level intermediate landings throughout the tidal range. The concept was described by BCC as “integrating technical innovation, flood resilience and elegant form to deliver terminals that will become iconic features of our river city”. The Central Park Central Thermal Plant (CTP) integrates new technology across energy and water systems, including shared thermal services, tri-generation, private electricity networks, wastewater treatment and sewer mining, to deliver low-carbon energy and low-impact water to residents, commercial tenants, building owners and the public domain. The precinct utility provides affordable, low-carbon energy and a reliable and sustainable source of non-potable water through an 18 MWr cooling/12 MWt heating central thermal plant, two MW tri-generation and one megalitre a day district water recycling and re-use system. The CTP is a highly complex industrial scale utility delivered in a dense urban precinct without compromising visual or environmental amenity. The project tested the governance structures of energy market regulation and broke new ground in the reticulation and commercialisation of thermal energy networks in Australia. The $78 million project has essentially removed the primary thermal plant from each of the buildings within the precinct resulting in substantial cost savings and environmental gains. Queensland Urban Utilities (QUU) manages $4.6 billion of water supply and wastewater infrastructure assets, with 125 water reservoirs throughout South East Queensland. The management of an increasing number of ageing reservoirs is an ongoing challenge for QUU. To ensure that the reservoir structure is maintained at the required level of service, a robust and consistent condition assessment approach is paramount in any long-term asset management strategy. SMEC worked collaboratively with QUU on a preliminary condition assessment and asset renewals planning programme for critical asset classes including potable water reservoirs. SMEC successfully implemented innovative approaches to field work, including the use of radio operated vehicles and remote CCTV technology, and developed standardised and repeatable methodologies for condition assessment, condition rating and criticality. Innovative ICT solutions were rolled out to streamline data capture and management. The application of technologies and streamlined methodologies to drive down the cost of data capture will help QUU better understand their asset base, support smart investment decisions around asset management and renewals, and reduce business exposure and service delivery risks. Since 1994 Sydney Water has been operating an Integrated, Instrumentation, Controls, Automation and Telemetry System, known as IICATS. IICATS is a sophisticated control system that monitors and automatically controls the operation of water and wastewater network assets, such as water pumping stations, reservoirs, valves and sewage pumping stations. The Judging Panel applauded the control and monitoring capability of IICATS which drove immediate savings for Sydney Water in terms of reduced site visits and avoided capital expenditure. In 2014/15 Sydney Water transitioned from a proprietary IICATS system towards an industry standard platform. This transition has given the organisation expanded scope to explore new operating functionality. To date, the project has delivered $500 million in CapEx and OpEx savings with significant future savings expected with new iterations and ongoing improvements. Each upgrade will improve Sydney Water’s ability to enhance service levels and decision making. Brisbane Airport is one of Australia’s fastest growing airports and is recognised as a key driver in the long-term growth of the Queensland and Australian economies. With a new runway being identified within the Airport’s Master Plan since 1983, the New Parallel Runway Project (NPR), formally approved by all appropriate governmental agencies in 2007, will effectively double the capacity of Brisbane Airport. The dredging and reclamation works, completed by Brisbane Airport Corporation (BAC) in June 2015, are the major component of the Site Preparation for Phase One of the NPR. These works were required to effect the necessary ground improvements for construction of the new runway system and involved the placement of nearly 11 million cubic metres of clean marine sand from Moreton Bay to fill and surcharge the site. Jan De Nul, and its Jumbo class dredge, the Charles Darwin to undertake the works. To realise the economic value of deploying such a large and expensive piece of equipment, BAC focused on planning and contract management, leading to the project being completed ahead of time and under budget. The NPR is being delivered on a 360-hectare greenfield site, two kilometres west, and parallel to the existing Brisbane airfield. With passenger numbers expected to grow to around 50 million by 2035, the NPR is essential to cater for increased demand. Delivery of the $2.1 billion Sydney CBD and South East Light Rail project involves significant city disruption, affecting a large number of commuter, pedestrian and business stakeholders. 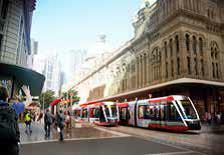 This includes a major shake-up of long standing transport services and the road network in Sydney’s CBD. Transport for NSW’s CBD Coordination Office (CCO) was established in May 2015 to ensure a strategic and proactive approach to managing these disruptions, and to provide a single point of accountability during the light rail’s construction. The Judging Panel noted that the CCO has developed effective working partnerships, at speed, with a range of stakeholders across construction and utilities, emergency services and transport services. Through planning, preparation and communications activities, the CCO has ensured the city continues to function during the construction phase. Through its Travel Choices programme, the CCO has also undertaken a targeted campaign aimed at CBD businesses, encouraging them to develop travel plans, to understand the travel needs of their employees, and to develop more flexible working practices. The Travel Choices programme has engaged with 58 businesses and more than 140,000 people to date. The Sydney CBD and South East Light Rail project is scheduled for completion in early 2018 with services commencing in 2019. The Gateway Upgrade North project involves the widening of 11.3 kilometres of the Gateway Motorway from four to six lanes between Nudgee and Bracken Ridge in Brisbane’s north. When complete, the $1.162 billion project, which is jointly funded by the Queensland and Federal governments, will reduce congestion and improve safety on this critical transport corridor, increasing the efficiency of Brisbane’s motorway network and connectivity to key urban areas. The Department of Transport and Main Roads (TMR) engaged Queensland Motorways, now Transurban Queensland, to jointly undertake the tender process – utilising expertise from both parties in a collaborative partnership rather than adopting a strict client-contractor structure, providing open and transparent sharing of information, readily accessible expertise and clear expectations. A shared governance structure, that included the Federal Government as majority funding partner, was also adopted, enabling all parties to exercise appropriate control over key decisions. Within a tight timeframe, the public and private sector partners achieved an outstanding balance between fostering innovation and maintaining control over outcomes. The $800 million Northern Gas Pipeline will connect the Northern Territory’s gas reserves to the Eastern Gas Market, enabling the sale of gas to new markets while securing supply to the growing Eastern Gas Market. The Northern Gas Pipeline project will see Jemena construct a privately financed, funded and operated pipeline, which will run 622 kilometres between Tennant Creek in the Northern Territory and Mount Isa in Queensland. Success in securing an optimal private pipeline solution, with minimal government funding support, resulted from a highly competitive – and flexible – bid process, whereby proponents had complete flexibility over the pipeline corridor routes. This partnership between the NT Government and private proponents enabled both parties to overcome commercial and technical issues that had previously frustrated the pipeline’s development. In particular, the challenge of pipeline utilisation risk was addressed through the provision of a supply agreement between the NT Government owned utility, Power and Water Corporation (PWC), and Incitec Pivot’s Phosphate Hill operation – which guarantees around one third of initial pipeline capacity for 10 years. The NSW Government successfully monetised a stream of base rents payable from Westlink M7, the private operator of the M7 Motorway, to Roads and Maritime Services (RMS) – a first of its kind transaction in the Australian market. Following a highly competitive two-stage bid process, the notes were issued with a tenor of 22 years at par for $174 million to Rothesay Life, a UK based insurer. Proceeds from the transaction have been earmarked for the NSW contribution to the NorthConnex project. funding in Australian dollars with no requirement for the Government to enter into complex and costly derivatives contracts. The 22-year tenor of the Notes is unprecedented in the Australian market and represents the first example of an unwrapped, Australian-denominated instrument being placed with a tenor of greater than 15 years – underscoring the global market appetite for well structured, long-tenor Australian credits. Currently under construction, the NZ$300 million (AU$268 million) redevelopment of Auckland prison will replace New Zealand’s only maximum security prison with a new purpose-built facility capable of holding 260 prisoners. The project was the first New Zealand Public Private Partnership (PPP) to include significant brownfield components, by requiring Next Step Partners to provide Asset Management and Facilities Maintenance services for the existing prison’s West facility, and to take on a number of risks relating to existing asset condition. As a result of receiving only one Expression of Interest (from the Next Step Partners consortium) the project was also the first PPP to be sole sourced – requiring an innovative procurement approach aimed at maintaining value for money in the absence of explicit competitive tension. This innovative approach enabled a contracted solution with a whole of life cost below the public sector comparator. The redevelopment also supports the goal of reducing recidivism through the provision of rehabilitation and reintegration programmes, capabilities that were not possible in the existing prison. The CityLink Tulla Widening (CTW) involves adding new lanes and other measures to improve traffic flow across 24 kilometres of freeway between the CityLink tunnels and Melbourne Airport – providing significant travel time savings to and from the airport during peak periods. The CTW was the first proposal considered, assessed and successfully closed under the Victorian Government’s Market-Led Proposal Guidelines – meaning the establishment of an evolved set of commercial principles between Government and the private operator without precedent. The project was also able to achieve value for money without the benefit of a full competitive process. This involved devising and executing a robust quantitative approach for measuring value for money, including tolling and traffic scenario analysis incorporating various macroeconomic assumptions. The successful negotiation of the CTW during what was a complex and uncertain project environment in the State is also worthy of citation. The total project cost is estimated to be $1.28 billion, and will be jointly financed by the Federal Government, the Victorian Government and Transurban, the operator of CityLink. The 99-year lease of the formerly NSW Government-owned electricity transmission business, TransGrid, achieved gross proceeds of $10.258 billion – the largest completed Australian M&A transaction of 2015, and the third largest power deal globally. The successful bidders, the NSW Electricity Networks Consortium, comprises a mix of domestic and overseas investors, including: Hastings Funds Management, Spark Infrastructure, Tawreed Investments, Caisse de dépôt et placement du Québec, and Wren House Infrastructure Management. This followed a highly competitive process with a total of four shortlisted bidding consortia. The sales price achieved, at circa 1.6 times TransGrid’s Regulated Asset Base (RAB), far exceeded industry expectations, as well as recent trading and transaction multiples for like assets. TransGrid is the first asset to be sold as part of the Government’s Rebuilding NSW asset recycling programme, with Ausgrid in market and Endeavour Energy expected to come to market in late 2016. The $1.15 billion Sydney Metro Northwest Tunnel and Station Civils (TSC) saw CPB (formerly Leighton Contractors), John Holland and Dragados (CPBJHD) construct a 15-kilometre twin tunnel from Bella Vista to Epping, undertake excavation and civil works for five new stations at Bella Vista, Norwest, Showground, Castle Hill and Cherrybrook, as well as two service facilities. The twin tunnels are Australia’s longest rail tunnels. Building Australia’s longest rail tunnels in an urban environment brought with it unique challenges, with CPBJHD adopting an approach to be ‘Ahead of the Game’ in all facets of delivery – from construction safety, quality and environmental management to community engagement. 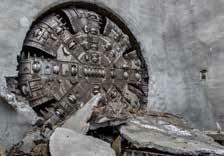 The Judging Panel especially recognised that the tunnels and stations were completed ahead of schedule and on budget, with four tunnel boring machines taking only 16 months to excavate and line the tunnels between Bella Vista and Epping. This allowed the NSW Government to accelerate progress on the $8.3 billion Sydney Metro Northwest project (formerly the North West Rail Link), the first stage of Sydney Metro. When completed in the first half of 2019, the Sydney Metro Northwest will see a train every four minutes in the peak – and will be Australia’s first fully automated, turn up and go rail service. Through the Byron Central Hospital Project, Brookfield Multiplex Constructions has constructed a new $88 million hospital at Ewingsdale, which will enable the decommissioning of Mullumbimby and Byron Bay hospitals, with services transferring to one purpose-built facility. On this project Brookfield Multiplex was committed to maximising the benefits of good community relations, as well as constructing an exemplar facility. The community engagement on the project included several open days during which the local community, organisations and stakeholders could take site visits and provide feedback on the progress of the project. Local contractors and suppliers were engaged on the project to boost employment opportunities for local residents. The project also provided employment opportunities for 12 local Indigenous employees, several of which completed a Certificate II in Construction Pathways while also sustaining full time permanent employment as a result. The new 10,000m2 hospital, now in the commissioning phase, will see services in the Byron area upgraded to a level three degree of care. The new facility will enhance healthcare services whilst also integrating community-based services including nursing, allied health, mental health and drug and alcohol services, which are acutely needed in the area. Byron Bay and Mullumbimby hospitals will remain operational until the new Byron Central Hospital opens in May this year, to ensure minimal disruption to patients and staff. Constructed in under 14 months, on time, under budget, defect free and with an exceptional health and safety record, the new hospital is on schedule to be operational ahead of time. The $275 million Post Entry Quarantine (PEQ) facility, awarded to CPB Contractors (formerly Leighton Contractors), involves the construction of 30 buildings to hold imported animals and plants in quarantine before their release into Australia. Structured as a design and construct package, the state-of-the-art facility, located in Mickleham near Melbourne’s Tullamarine Airport, will replace three existing, ageing, facilities in Sydney, Melbourne and Adelaide – consolidating biosecurity operations into one fit-for-purpose location. The facility includes modern laboratories, cat and dog kennels with high standards of animal welfare, technically sophisticated design for avian and plant compounds, horse compounds, a high level of security and public zones for visitors. More than 2,000 people from 35 different subcontracting organisations have worked on the site to date. Over 1.1 million man hours have been worked with no lost time injuries. The facility welcomed its first intake of animals in late 2015, and is scheduled for completion in 2018. The $370 million Western Australian Schools Public Private Partnership (PPP) will see EduWest deliver WA’s first ever PPP for state education facilities – featuring four new primary and four secondary schools. The Judging Panel noted that as the Financial Advisor to EduWest, Macquarie Capital helped develop a robust, flexible and value for money financing solution, tailored to facilitate the engagement of two relatively smaller, but specialised, builders. This required a hedging strategy to mitigate interest rate risk, an innovative risk allocation schedule and detailed whole of life modelling and optimisation. As well as a focus on ecologically sustainable development, EduWest is bringing an innovative but standardised approach to design across the portfolio of schools, assisting to ensure value for money through efficiencies of scale, and establishing a design template for use in the rollout of future schools. The project is expected to deliver savings to Government of circa $100 million over the life of the concession. The Law Courts project is the Australian Capital Territory’s first Public Private Partnership (PPP) – an important pathfinder for alternative procurement models in that jurisdiction. Juris Partnership will design, construct, finance and commission the new Supreme Court and common facilities, incorporating: eight courtrooms; judicial accommodation; support staff areas; jury and vulnerable witness facilities; and an expanded custodial facility. The pathfinder project required KPMG, as the commercial and financial advisor to the ACT Government, to test a number of key commercial and policy positions, including options in respect of a public capital contribution and interest rate management. The physical and contractual integration of the Magistrate’s Court redevelopment with the construction of a new Supreme Court also required a carefully constructed commercial risk allocation to ensure best value for money to the ACT – including significant whole of concession risk transfer to the private sector. Construction will commence in 2016, with Juris Partnership commencing interim facilities management services to current users of the facility, concurrently with, and throughout, the construction phase. The $800 million Northern Gas Pipeline (formerly the North East Gas Interconnector), will see Jemena build and operate a 623-kilometre pipeline from Tennant Creek in the Northern Territory to Mount Isa in Queensland, on behalf of the NT Government. Inflexible commercial models and other challenges have previously served to frustrate the Pipeline’s development, with parties unable to overcome the risk of low utilisation. A highly competitive – and flexible – bid process, whereby proponents had complete flexibility over the pipeline corridor routes, helped break this “catch 22”, with the Government successfully securing a private pipeline solution with minimal government funding support. The risk of low utilisation was addressed through the provision of a supply agreement between Government-owned utility, Power and Water Corporation, and Incitec Pivot’s Phosphate Hill operation – which guarantees around one third of initial pipeline capacity for 10 years. For a project of such complexity a solution was also achieved within a short period of time, with Jemena submitting a detailed final proposal within 13 months, and achieving financial close within 14 months. 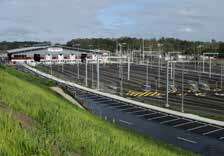 The $1.6 billion Toowoomba Second Range Crossing (TSRC) is a 41-kilometre bypass providing an alternative crossing of the Toowoomba Range in Queensland. The project is being delivered as an availability-based Public Private Partnership (PPP), with ongoing service payments over a 25-year operation and maintenance period. The Federal and Queensland governments will provide upfront funding on an 80:20 basis, committing $1.285 billion and $321 million respectively. The TSRC will be tolled for heavy vehicles, with rates to be finalised closer to the road opening, expected in late 2018. The procurement process was designed to encourage tenderers to develop innovative design solutions. As a result, the responses received included a large number of alternative value-added design solutions, such as replacements for the tunnel option detailed in the reference design. The final scope of the project was enhanced with five value-added options, ensuring strong value for money outcomes. The TSRC is expected to facilitate an increase in economic activity in the region by $2.4 billion over 30 years through a travel time reduction of up to 40 minutes for heavy commercial vehicles.